Family Crest Jewellery, featuring your Family Coat of Arms and Family Crest ensures your custom made item will be handed down for generations. Handcast from your Family Coat of Arms, each piece of Jewellery is custom designed with our Jeweller, who has been creating our unique Heraldic pieces for over ten years, and has over 40 years creating bespoke jewellery pieces and designs. He resides on the Gold Coast. Your unique Family Crest Jewellery item can be made from Yellow Gold, Rose Gold or White Gold, Titanium or Sterling Silver. Some designs have a combination of different metals to give it a two or tri tone effect. This is great if your Coat of Arms has multiple colours. Family Crest Jewellery Rings are made specifically to your finger size, so it is important to get your finger measured at a local jewellers. All family crest jewellery items must be individually quoted and require the correct ring size at the time of making the request. Prices displayed are indicative only. The design process can take a few days or a few weeks to get it just right. The entire process is done via emails, photographs and phone calls, with detailed CAD drawings employed in some situations to ensure no detail is left out. You chose from the Top part of the Family Crest, The Main Shield or your full Coat of Arms. Select the design style and ensure to have your finger correctly measured at a local jewellers. 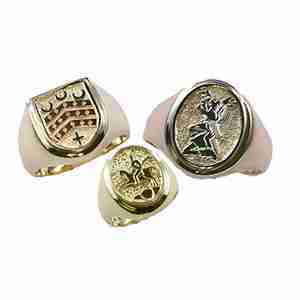 All of our handmade coat of arms rings and family crest jewellery pieces are marked with identifiable stamps. These marks identifies the Jeweller who created the piece and that it is Australian made. The Guild mark identifies that the item was made in a workshop. The marking system provides full provenance of the item in the marketplace, often with subsequent valuation. The marking system enables the owner to trace the jeweller in case of repair or maintenance. There are a few options to reduce the cost of your family crest jewellery ring – such as a Hollow Back or Flat back finish. The Hollow Back uses less metal, and reduces the overall weight of the piece. It doesn’t look or feel as finished as a Flat Back, but may help in aligning the finished item with your budget. If you are serious about having your very own piece of family crest jewellery designed and made, we can talk about an interest free payment installment plan, without the need for credit cards. There are many options available to you to help acquire your item. Please ask and tell us if you would like to pay the item off over an agreed time frame. family Crest Jewellery will be sent to you once you’ve paid for your item in full. Call us to talk about your desired family crest jewellery piece, and to see how your Family Coat of Arms can adapt to suit your fingers, ears, cufflinks, bracelets, brooches, tie and money clips. If you can think of it, we can create it. 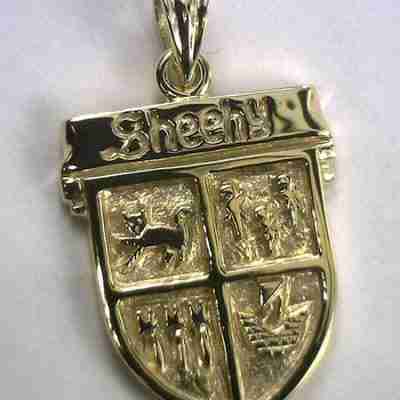 If you have a special family crest jewellery request, please let us know.